In the traditional satcom business case dominated by video, the satellite and the orbital position were the core differentiators (multicast advantage, platform effects on DTH and Video Distribution). However, in a world that is increasingly dominated by data, raw satellite capacity is commoditizing and the new entities driving growth are networks. This has tremendous implications for the entire value chain, and only the most adaptable actors will survive this profound transformation in the industry. How can networks enable future industry growth? As value shifts from satellites to networks, the ground segment is becoming a strategic element in the satellite ecosystem where VSAT platforms are poised to capture impressive growth in the coming years. 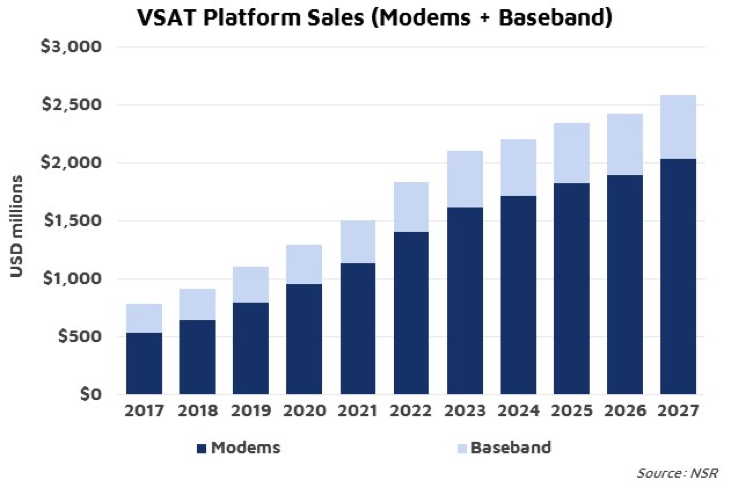 According to NSR’s Commercial Satellite Ground Segment, 3rd Edition report, VSAT platform revenues will grow by a factor of 4.8x in the next 10 years. But this is not going to be an easy journey, as this space is becoming highly contested and vendors will be pushed to continually innovate both on the technological as well as business model fronts. With the number of beams multiplying rapidly, skyrocketing throughputs and exponential growth in the number of terminals, satellite networks are reaching unprecedented sizes. VSAT platforms need to scale to meet new performance requirements; however, CAPEX investment cannot rise with network size. New architectures like digital payloads, beam hopping or beam forming and the rise of constellations (from GEO, MEO, LEO or combined) will make networks highly complex. Adopting automation and SDN/NFV approaches is crucial to operate future networks cost efficiently. At the end of the day, what matters most is enhancing the user experience. Consequently, measures like higher throughput might not necessarily mean a better service. One could potentially improve “time-to-content” via faster throughput ramp-up time (for peaky traffic) or by offering local caches for popular content. As platforms reach the physical limit of bandwidth efficiency, the next big wave of innovation in the ground segment will come from optimizing traffic, integrating with terrestrial networks and improving user’s QoE. All these technological and business model evolutions make it increasingly difficult to differentiate between space and ground segments. Systems need to be designed in tandem to activate synergies. Consequently, a growing number of operators select a single platform per HTS payload or eventually per constellation. This means that VSAT systems need to be able to serve a wide array of applications, from low-end consumer broadband to high-end mobility applications. Now that satellite operators have control over networks, service providers are pushed to add value on higher layers. Platforms need to offer robust and flexible APIs to support these targeted solutions (Big Data, OTT applications, etc.). Equipment vendors need to make their networks easy to adopt. In order to ease the CAPEX burden and minimize the know-how barrier from customers, some platforms are developing “Infrastructure-as-a-Service” models. Gilat, for example, is very focused on the Cellular Backhaul segment, building entire networks for MNOs in exchange for multi-year commitments to pay for the service. Similarly, UHP introduced a cloud-based network management system to lower the barrier of entry for deploying VSAT services. All in all, ground segment suppliers are pushed to take greater risks to capture growth. Sometimes this gets to the level of sharing commercialization efforts with the satellite operator (revenue sharing schemes) or even co-investing like in the recent JV between Hughes and YahSat. The satcom industry is moving towards a data-centric business case where VSAT platforms are one of the key enablers for growth. This will catapult equipment revenues for those vendors that can meet the new requirements. The ground segment is now a crucial asset for satellite operators’ businesses. Outsourcing this won’t work anymore as networks will be the future differentiator. Space and ground segments need to be designed in parallel, and operators must accept part of the risk/effort in developing the required technologies. In parallel, the role of equipment vendors is evolving, and they will be pushed to take greater responsibilities ranging from offering network management support, incorporating Infrastructure-as-a-Service structures or even sharing the go-to-market risk.